Another weekend gone and a special week ahead. It is my birthday week. While I am not super pumped about getting older, I am happy to have a wonderful life. Definitely so many things to be grateful for. Plus I have a full week of posts coming at you this week. Today I have a weekend update. Tomorrow is my S'mores link up with so many yummy s'mores recipes. Wednesday is my birthday and I have a special post coming up. Thursday is a Thoughts and Confessions post and Friday is the normal Friday favorites. Can you believe tomorrow starts August? Where has the time gone? Anyways, back to the weekend. Friday after work, we ran a few errands to Trader Joes, the post office and the local doggy store. We came home and decided to change the girls cribs into toddler beds. Earlier in the week, Sutton had tried to climb out and had fallen. Luckily, they have a foam alphabet pad under their cribs. But the girls are loving their new beds. Around 5:15, I left to go meet Heather for happy hour. I haven't seen her since she was in the hospital a few days after her brain surgery. She is doing so well and has recovered beautifully. After catching up, we headed over to a local ice cream shop for a scoop and to see what was going on for Art Town. There was going to be a movie in the park, and we were not prepared for that, so we parted ways and headed home. Saturday morning we headed to breakfast and then came home for a bit before the girls and I headed out to Hobby Lobby and Costco. The girls were a bit crazy in Hobby Lobby and asked to go home. Ugh. Luckily, I found the clear ornaments that I needed for their birth hats and bracelets. I barely got to browse the Christmas and Halloween area. Ugh. They were so much better at Costco though. After errands, we came home and I made the girls lunch. Just as they were about to eat, Rory came home. The girls napped for about 2 hours and the thunderstorms started rolling in. Once the girls were up, we headed to RC Willey to look at beds and tvs. They had killer deals on tvs and we bought one along with a sound bar. Plus they are installing it all for free this weekend. Huge savings. It was pouring the entire drive to RC Willey and was still raining after we left. 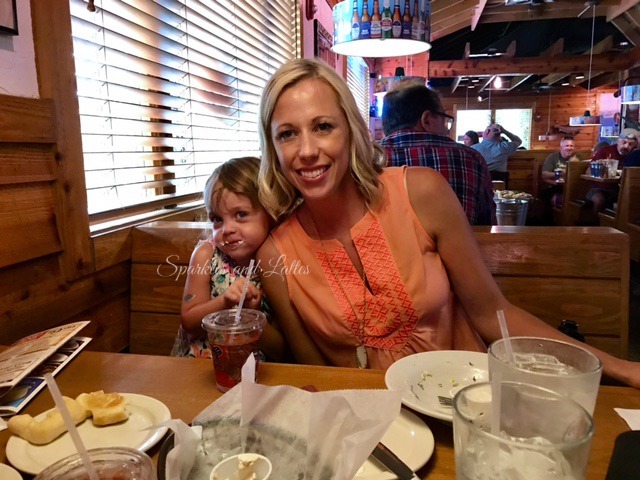 We went to an early dinner at Texas Roadhouse and the girls had a blast. They loved when the waiters danced. We haven't been in years, but had a great time. Plus it was super close to where we were. Avery loved the rolls and butter. After dinner we went to a park nearby so the girls could burn off some energy. We love this park and the girls do too. Check out how big the play structure is. It is three stories even though you can't see the whole thing. After the park, we headed home. The girls were falling asleep in the car on the way home, so we put them to bed right away. Then we relaxed and watched more thunderstorms roll through. Sunday morning we got up bright and early and packed our things for a beach day. We stopped for coffee, some bread and pastries before heading up. We got up there early, but it was packed again. Luckily we found a good spot which turned out to be better because an hour in, some people left and we were right next to the water. The girls played, we had lunch and people watched for about four hours. It was glorious. I can't get enough of this view. We left right around 2 pm and headed back to our house. Once we got home, we unpacked things, got showered and then I headed back out to Whole Foods for groceries. Once I got home, I made my s'mores recipe (nothing like last minute) and then started dinner. We had spaghetti and it was perfect after being out in the sun all day. After clean up and some cuddles, the girls went to bed and we watched some tv shows we had on our DVR. You guys are all just so stinking cute and you do the most fun things with the girls! Yippee, I am celebrating you all week, it's your birthday week and it's going to be a great one, I just know it! Looks like you all got a lot crammed in. What a fun weekend! Those little girls are getting so big, so fast - and that playground looks just perfect for them. I think Spencer would have a blast there. Also, those water views - seriously swooning. We need to plan more lake days here! 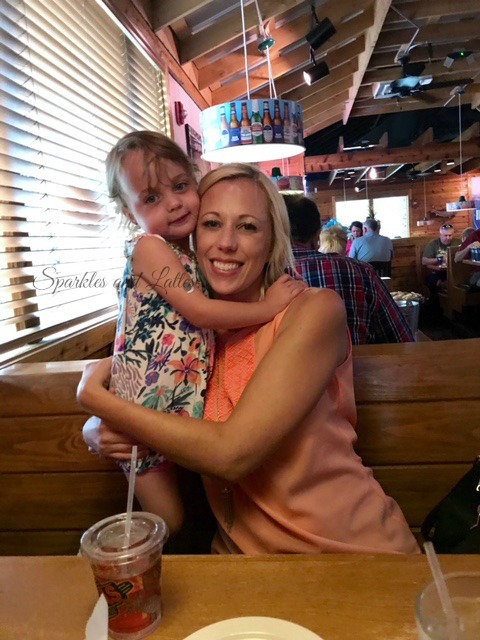 Kids love Texas Road House for sure, my friend's little girl picks that for her birthday every year! The beach looks so fun! You crammed so much in this weekend, good for you! Have a great day! Yay for birthday week. I hope it’s one of the best yet. I really can’t believe that tomorrow is the first of August. Summer (and this whole year, really) has flown by. Turning the cribs into toddler beds is so bittersweet. Glad to hear that your friend Heather is doing well after her surgery. That park looks awesome and huge! So jealous of your beach day!! That beach view with the mountains is stunning! I hope you have the best week. I'm so glad to hear that your friend is doing well. I actually thought about her the other day! And girl, we LOVE Texas Roadhouse! Those rolls with cinnamon butter - YUMMMM! That view is absolutely amazing!!!! Wow!!! That water is seriously amazing! What a view! Look at those big girl toddler beds!! We lowered Zoe's crib mattress last week and I had just made a comment to Chris about how next thing we know we will be converting it to a toddler bed.These kids grow too fast! I am dreading switching E's bed because I think I may never get her to sleep in it and she;s on the second floor. I need a beach day, but we do go to the beach in a month, so yeah!